Beware, Cupcakes – gourmet donuts have arrived. They have been around for a while in NY and Seattle, but this is Boston’s first entry in to the genre. The shop is small and is only open Thursdays – Sundays from 9am till they sell out. There are only a handful of flavors available such as Chocolate Chipotle, Vanilla Bean, Honey Almond, and a Dulce de Leche cinnamon roll. The Globe did a complimentary write – up last week, so the long line was expected. But it moved quickly and gave me time to debate between the Maple Bacon, which people have been raving about and the Hibiscus Cherry, which sounded interesting. By the time I got to the front, I decided to get both. I was glad I did; they were quite different in flavor profiles. 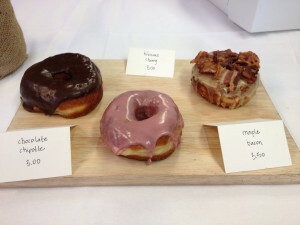 The base is the same – a large raised donut that has a light crumb and a pleasing chew, but the maple bacon was a contrast in sweet, salty and smoky where as the hibiscus was sweet and tart with just a hint of a floral note. I enjoyed both. The donuts are not cheap; most are $3, and the maple bacon is $3.50. I don’t know if I want to live in a world where a dozen donuts is $36.